Continuing with my fascination of studying John Singer Sargent portrait drawings. 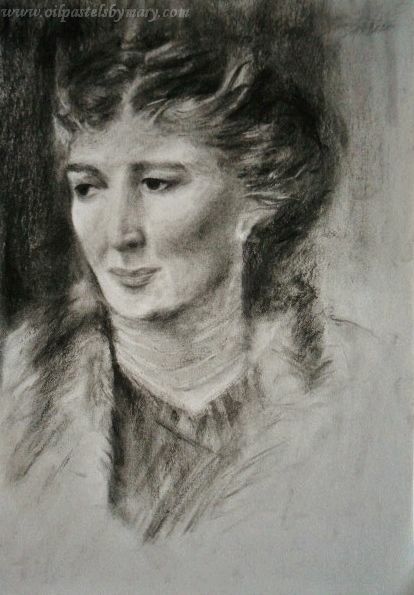 One of his portraits, Mrs. John Beals Mills, illustrate just how brilliant of an artist he was with a loose style for backgrounds and incidental elements, to his focus on the face for the precision accomplished with soft and hard edges, and value ranges. Incredible work. My drawing study of Mrs. John Beals Mills, 12×9, was done in charcoal (love this stuff for portraits) using both vine and pencil, and a kneaded eraser. This free-hand drawing took about 3 – 4 hours, mainly because I wanted to be more precise with her face proportions. My purpose in studying John Sargent Singer is to learn portraits in this loose style and hopefully develop character to individuals that I may draw at a later date. This entry was posted in Drawings and tagged charcoal, drawing. Bookmark the permalink. Lovely…her expression is felt through your artwork! Thank you so much Johannis, I really appreciate your thoughts on this piece! Awesome job, Mary. She looks like she could just step off the page. Thanks Judy – I really appreciate it! Soft and beautiful. Love the treatment of the hair. I cannot imagine accomplishing that in 3-4 hours!! Thank you Madhu. 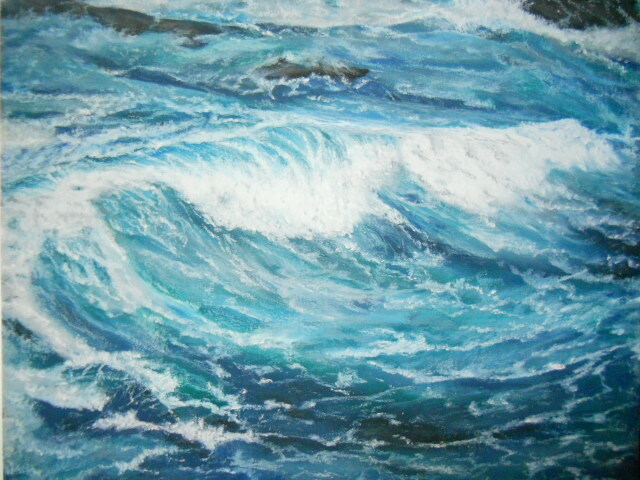 It was a really fun experience – I started getting into a flow just as I do when painting the ocean. I’ll be doing more studies for sure. Hi Doron – you know how to make my day, thank you so much for your gracious comment. I have a long ways to go to understand the human figure and drawing it, but it’s a great benefit to me to examine an old masters’ work and try to learn from it. Ha, I have to use a magnifying glass to really see the details – these tired eyes need all the help they can get! Thank you my friend. I thought you might like to see Trent’s post about seeing colours, Mary: I thought of you immediately. I thought of you today. I took a short ecourse from Adam Morelli….what talent this man has. Any hoo, he talked about the theories painters and artists have and how photographers can use the same practices to apply to their art. Have you heard of him? Hi Laurie, thank you! I haven’t heard of Adam, so I took an opportunity to visit his website – there is some beautiful work there. Thanks for pointing it out. He is right there are a lot of similarities in the theories of both practices – no doubt you’ll enjoy his course. Amazing how much contrast one can do with only one color. Cheers to your effort!!! Thank you Frank! This charcoal is so darn interesting to draw with – there is a kind of freedom that I definitely don’t have with oil pastels. Ah Mary…you are SO good at what you do. Lovely! Lovely work, Mary! I’m looking forward to this new “loose style”. Have you ever tried automatic drawing or blind contours? Thank you Millie, not sure I’ll ever achieve this in oil pastels – but you never know. I’m not familiar with automatic drawing or blind contours, but will check the styles/techniques out – thanks for the suggestions. My pleasure, Mary. Please document it for us if you do! Lovely! And the eyes…so special. This is wonderful! I love, love, love John Singer Sargent! Love visiting the exhibit at the Boston MFA. His oils I find incredible! The way their eyes follow you around the room. Fantastic! Thank you Elizabeth, you made my day – so glad you enjoyed this piece. I agree his work is so incredible, I’m learning a lot by studying his work – yeah those following eyes, so great! For me there is nothing more impressive than standing in front of a masterpiece, I could stand and look for hours. Beautifully rendered, Mary! It looks like you enjoyed every stroke. Wonderful! I absolutely love your loose style drawings! Reflects so softly, tenderly the characters and is amazing how well you adapted to the technical part of applying the layers! I can feel how loose is your wrist when you work on this drawings, perfectly executed! Thank you Eva – really appreciate your thoughts on this piece. One of the things that I want to accomplish is a soft appearance with these loose portraits, while charcoal (mix of lights and darks) can create drama, I’m after a softer side – so it’s going to take a while to first get confident with the medium and techniques and eventually I hope to get there. So happy that you noticed the loose flex of the wrist, kind of fun to swoop and strike, then sweep at the surface. Charcoal is turning out to be a lot of fun to draw with. They’re all good, Mary, of that there’s no doubt, but, for me, this is really special. Thank you John for your nice comment and compliment – yes, Mrs. Beals Mills is special, I feel like I spent a few hours with her and got to know her a little bit! Thanks again – back to my rock studies. Like this one much better ! – although take II of the previous one was pretty good, too. Ah M.R. thank you very much – twice! No one needs to be an artist to offer their opinion – art is whatever it means to you and maybe that’s why I enjoy art so much. Hope you are having a lovely weekend. Wow. Mary, you are absolutely amazing with these portraits. I can’t believe you don’t do this as a regular practise. You really should! What I see in this one as opposed to the original (yes, I looked her up) is that your Mrs. Sears seems a bit older and perhaps a bit more disillusioned (makes sense if she’s older, right?) But definitely you captured her and she is on that canvas/(paper?)! Also, you know, I just realized…..my artist friend that I told you about is also Mary. How strange that the 2 people educating me on art share the same name! Lastly, what did you think about the copyright issue I asked you about? Am curious about your thoughts on that. Thank you A really appreciate it! Your comment does make sense, need more practice on proportions and appropriate value ranges to bring a younger appearance to Mrs. Mills. I forgot to answer to your question over on your blog about the copyright question. Have a nice weekend and thanks for checking in. Beautiful! I saw some Sargent work today in the Philadelphia Museum of Art. Great to be reminded of his talent. Fabulous work, Mary!!! Does it seem to you, as it does to me, that your Mrs. Mills looks a bit more worried than Sargent’s? Hi Cynthia, thanks! I agree and wasn’t sure if maybe her eyes were too dark, but perhaps worry means there is too harsh of values somewhere by her brow, right? Enjoying hearing your opinions – I’ll let her sit awhile and see what jumps out at me. Thanks always – means a lot that you would take the time to look up Mrs. John Beals Mills.